You expect the best from us when we take you out on the water. We demand the best from the clothing we use. We chose top-of-the-line items from companies we trust and use every day on the water. Have a question about our clothing items or our trips? We would love to answer any questions you may have about our clothing items, sizes or colors. We are also available to answer questions about our trips. Please send us a quick message and we’ll get right back to you! To order, please fill out the order form. Please have the item description(s), size(s), and color(s) available when you fill out the order form. 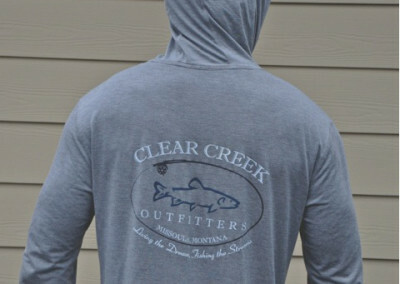 Clear Creek Outfitters is proud to be one of Missoula’s first distributors of Free Fly Bamboo Apparel! These items are made using 100% organic Bamboo. They breathe better than anything on the market! Ultra moisture wicking, thermal regulating, antibacterial and odor-free. Never Be hot again!! UPF Sun Protection (strength depending on model. Free Fly logo screen printed; location depending on model. 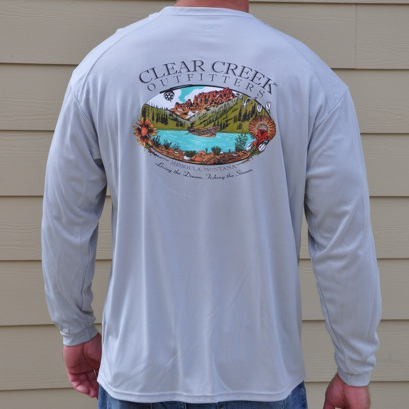 Clear Creek Outfitters logo screen printed; location depending on model. 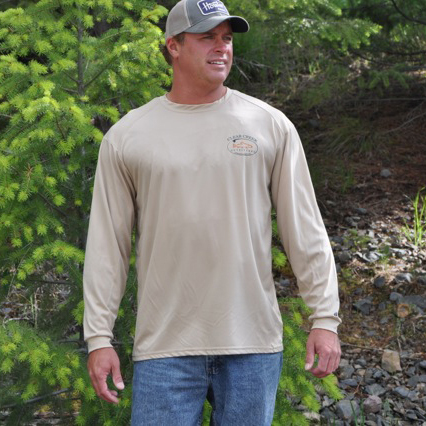 Clear Creek Outfitters is proud to be one of Missoula’s first distributors of these 100% Organic Cotton items! These items are made of 100% organic Cotton. Only 3% of the World’s cotton is Organic. So soft and super thin, you will hardly know it’s on! Poly blend for warmth, comfort and versatility. Thin yet insulating blend keeps you warm while keeping you dry. 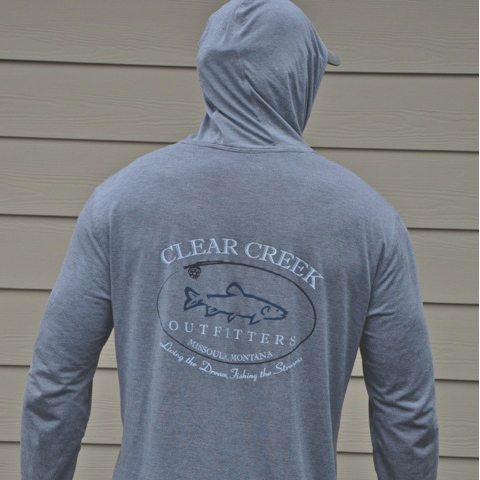 We at Clear Creek Outfitters insist on clothing that works as hard as we do! 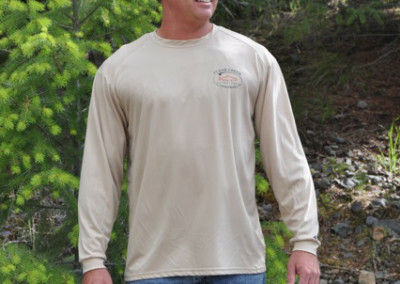 These poly blend shirts have the best combination of warmth, comfort, function and price that we have found on the market! 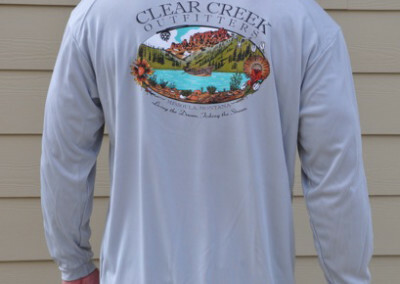 Clear Creek Outfitters logo screen printed on left breast and center back. 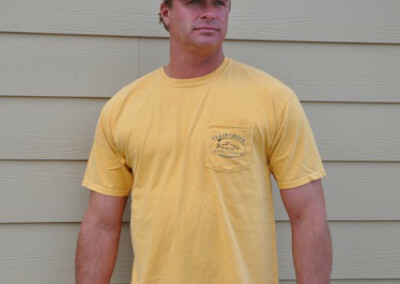 Pigment-Dyed & Direct-Dyed Ringspun, this T-Shirt is made of high quality 5.6 oz.100% preshrunk ring spun cotton which offers a soft feel and is light in weight. 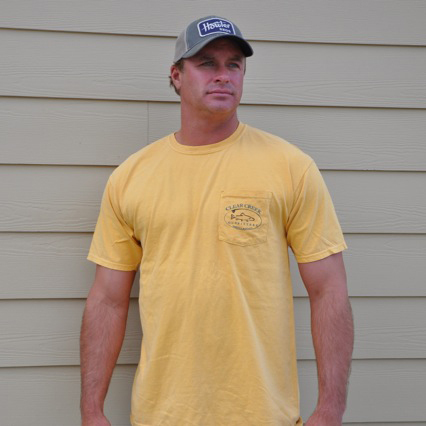 Shirts feature double-needle stitching throughout with shoulder-to-shoulder tape.